Some of our most cherished projects deal in disruption. Currently partnered with Classicspecs.com since early 2015. While other competitors have as much as a 20 year or more head start on a national level, we were able to show steady and constant growth over a 2 year period and continue to take up more market share year over year. This is a national and in some minor market share instances a global campaign with total number of competitors in the tens and in some cases hundreds of millions of competitors. As we are normally accustomed to these challenges and have built our business around luxury we were very pleased to help this brand dramatically improve their organic placement and traffic. 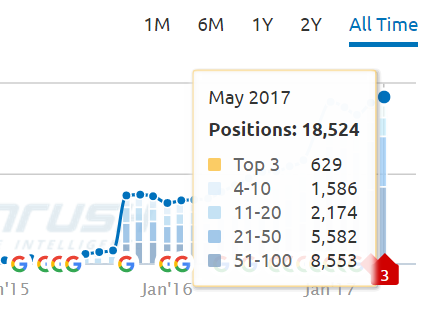 Within our initial 2-year cycle, we increased the total keywords exponentially by a multiple of 32x greater than when we started the campaign, 17 x the number of Top 3 listings and increased the total traffic by almost 15x the original number of viewers. The overall result was staggering but unlike most SEO companies that boast results without talking about the challenges, in late 2016 we saw an industry wide pullback from the changes Google was making in their algorithm. While we did suffer a temporary setback on traffic, we did almost immediately recover our rankings and improve as other competitors began to fall away. These turbulent cycles only come along once a year and in some cases every couple of years but with a staff of professionals who constantly read the trends and test sites of their own, our clients have always blossomed into new watermarks and ascended over time. We hope you will give us the opportunity to earn your business in the long term as you can see by this example it shouldn’t take long to show you what your site is truly capable of.